Cross-Cultural communication in the field of Science, Art, and Design is a part of aspect that influence the growth of creative industrial product. 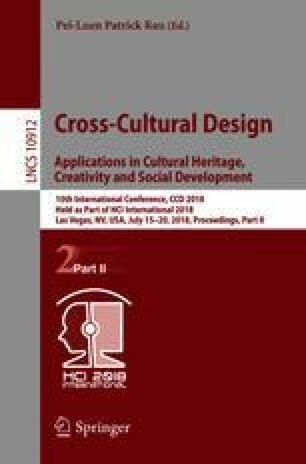 In the context of product design in creative industry, a research related to cross-cultural communication, cultural wealth is a potential source of inspiration in creating global design products. The exploration can also make the culture more adaptive in globalization era with the transformation. There was a lot of studies to exploit cultural products objects into new design products, but not all of the studies using a relevant methods. One of the cultural product that has wide potential is traditional board games. Traditional board game has different character from artefacts because besides its physical form factor, it has an invisible aspect in the form of game rules. In traditional board game design products require special treatment to be able to research and understand it properly. In-depth research an appropriate approach method is required considering the transformation process of traditional game, not only limited to the conventional media shift into new media. This research tries to find the better method in processing the potential of traditional board games, which will later become a map in the research development. This studies aims to find the research stage by applying the model “From SAD to CHEER” in the context of traditional board games studies.